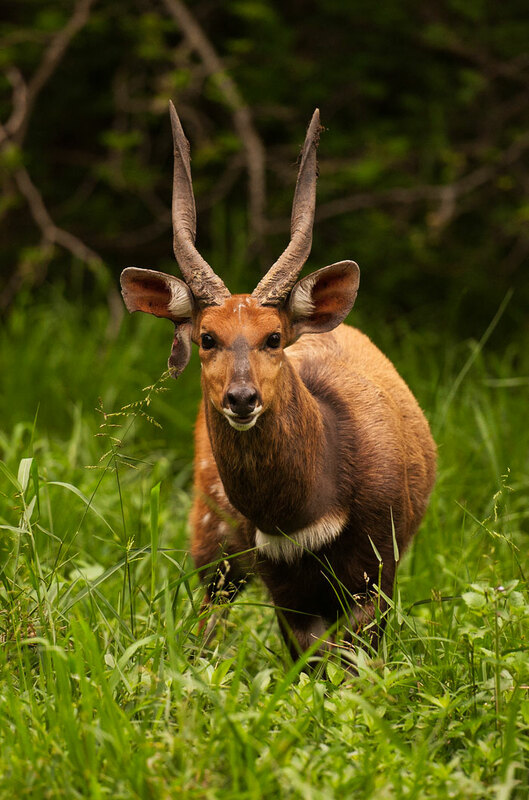 A bushbuck displays a former battle wound – a huge tear in his ear, most likely the result of being pierced by another male’s sharp horn. 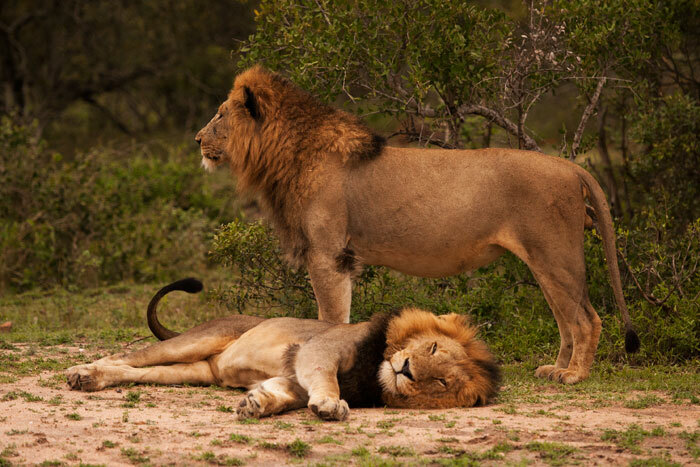 Two of the Majingalane Males settle in for the day after a long night of territorial patrols. After last week’s incident when they attacked a young intruder from the south, the four Coalition members have been spending a lot of time this week reaffirming their turf. 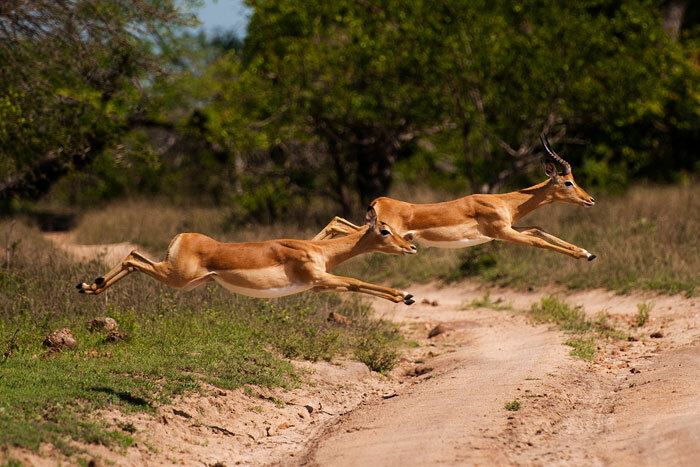 A young male and female impala jump in unison across the road, following the rest of the group. You can see here that the female is heavily pregnant. Soon enough, in November, we’ll be seeing lots of impala lambs! 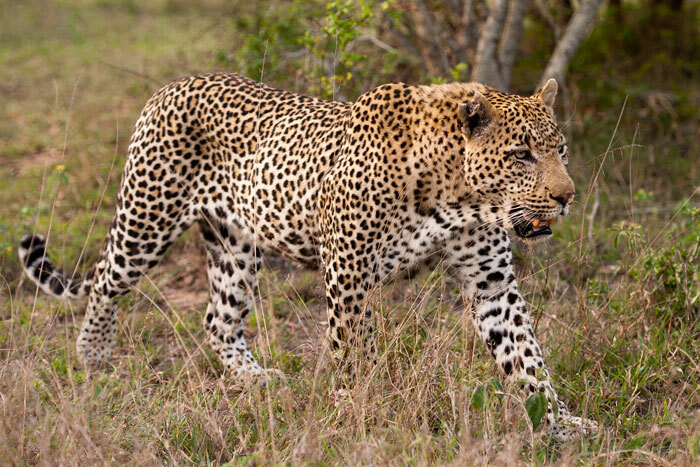 We found the Nottens Female the morning after she’d been seen mating with the Tugwaan Male, walking down the road back to her own territory. 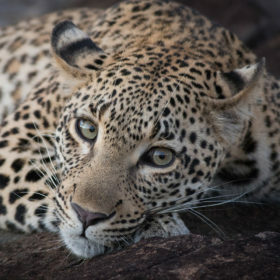 She has sustained a wound on the back of her leg – not from the mating but most likely in a territorial dispute with another female recently. Hungry after mating for a few days without eating, she was focused on finding a meal. 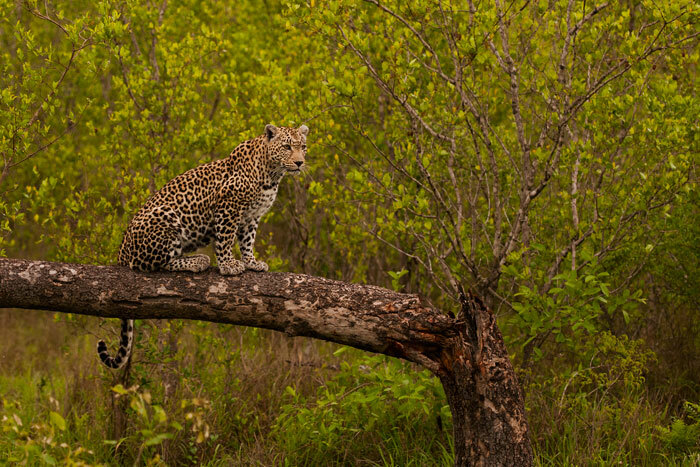 She climbed a fallen tree to look for nyala nearby, but disappeared into a thicket soon after. 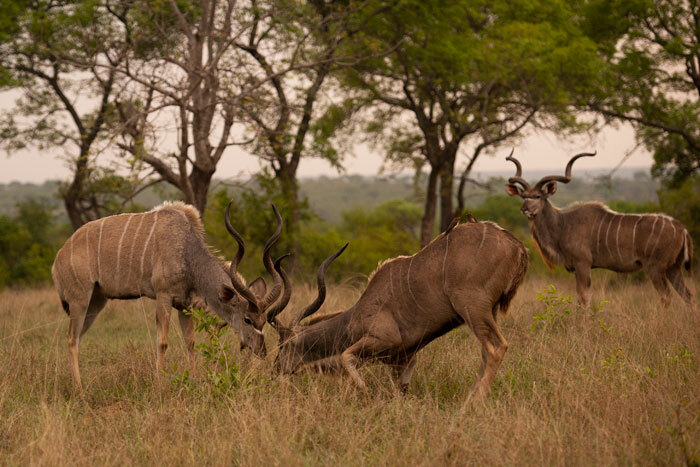 Two impressive male kudu engage in a face-off while a third male looks on. 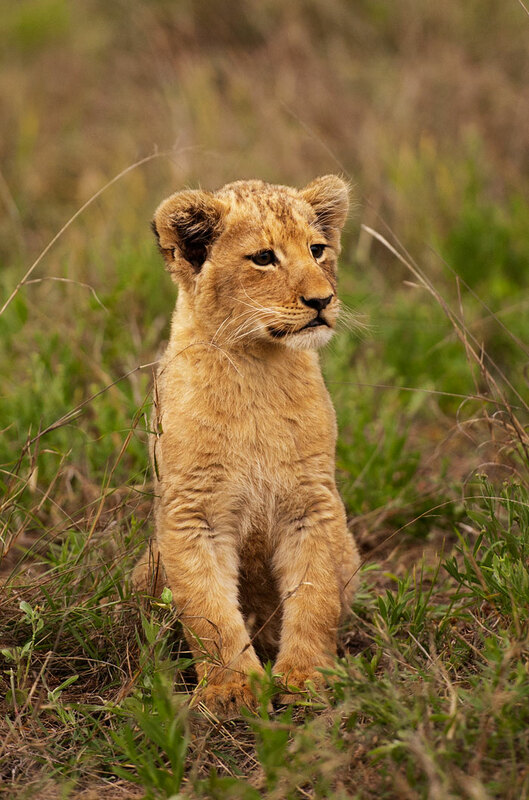 A lot of time this week was spent with the cub of the Tsalala Tailless Lioness. The little girl is getting big, and extremely curious! 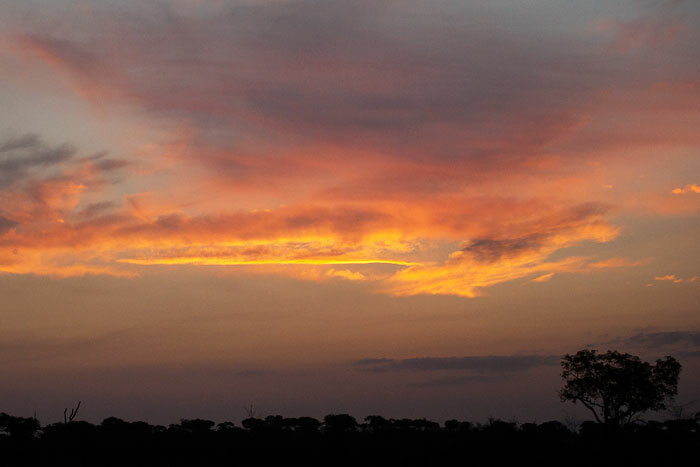 Sometimes it isn’t the sunset itself but the moments after that deliver the most brilliant skies. 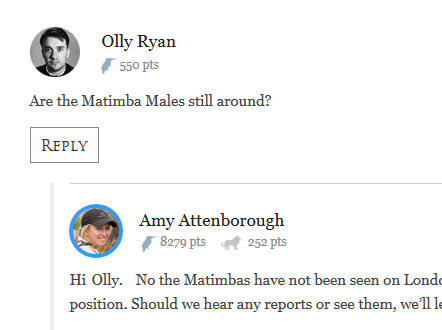 The Marthly Male continues to expand his territory further south. 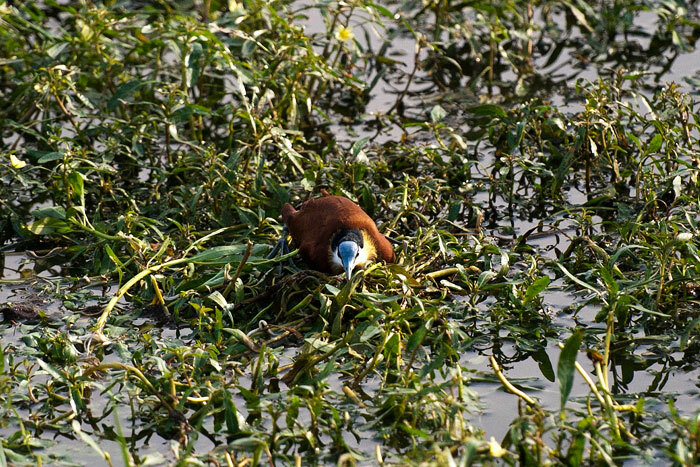 An African jacana sits on its nest, built on aquatic vegetation. One of the interesting things about this beautiful bird is that the father does the parental care, including the incubation of the eggs! The next morning we returned to find the nest without the father, but were able to count four eggs. 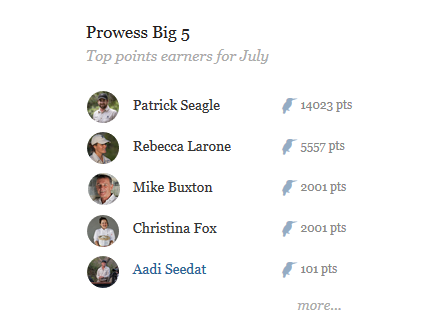 We are looking forward to tracking the progress of the little ones over the next few weeks. 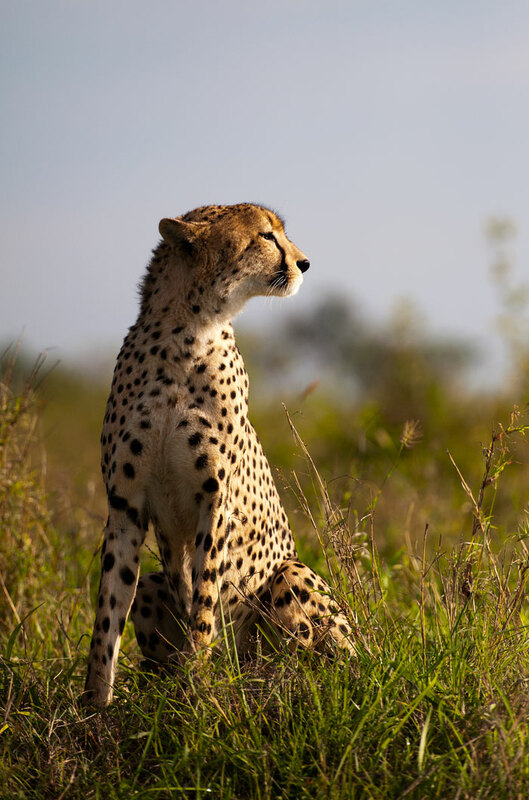 A great spot by Freddy one morning, the male cheetah was sitting atop a small termite mound scanning for prey. 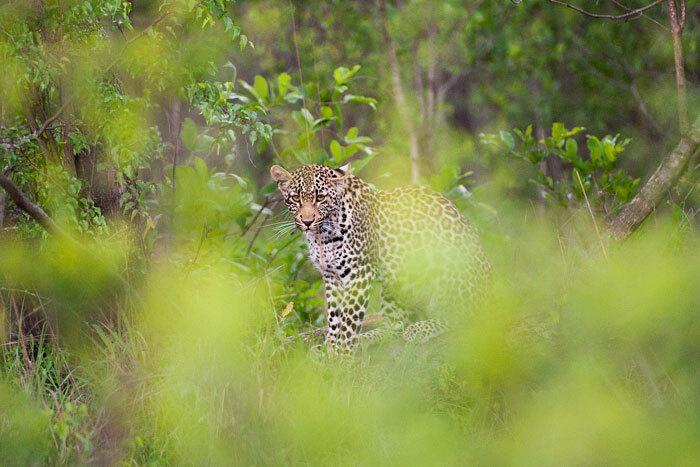 I can’t emphasize enough how lucky we are to have this beautiful animal settled on Londolozi. Quite often, however, guests ask, ‘Isn’t he lonely?’, which is a justified query! 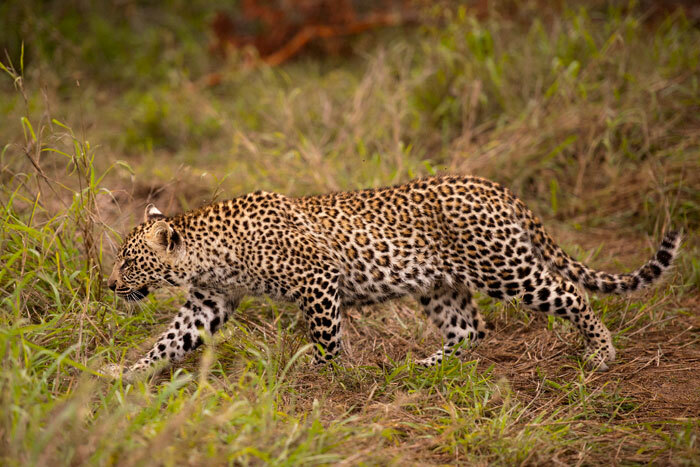 Once he becomes fully mature, he will most likely look for females at some stage, and we’re not sure whether that means them coming to him or him leaving us… we hope it’s the former! 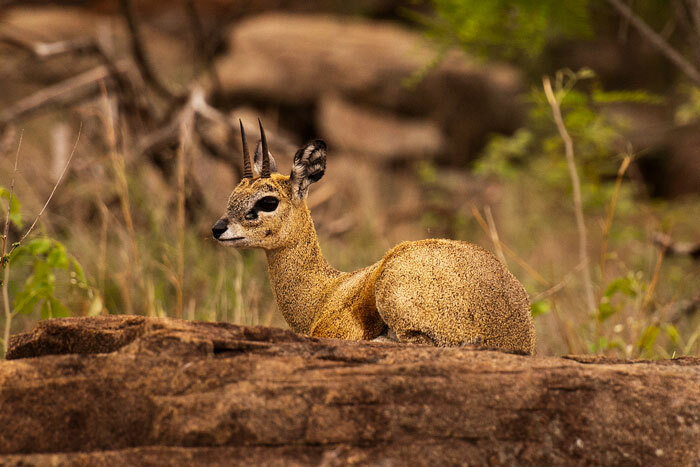 Specialized in living on bare rocks, the klipspringer is often a challenge to spot amongst the rocky outcrops of northern Londolozi. 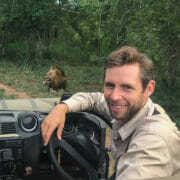 We found this very relaxed male resting close to the road on Ximpalapala Koppie. The Dudley Riverbank cub is getting big! 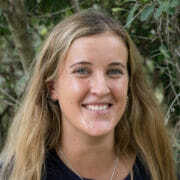 This week her mother killed an impala which they feasted on over a five day period, providing for fantastic sightings of them! 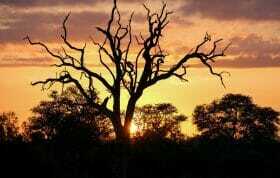 As the remains of the carcass dwindled away, the Dudley Riverbank Female hoisted it into a nearby Acacia tree. 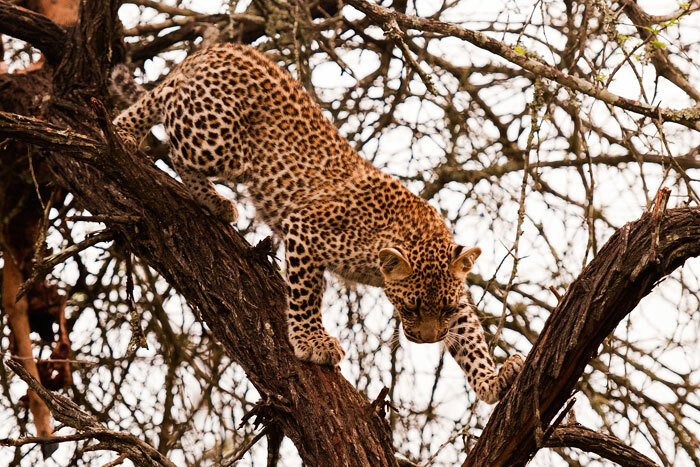 Her cub climbed up and down, not feeding on the impala but rather playing with it. 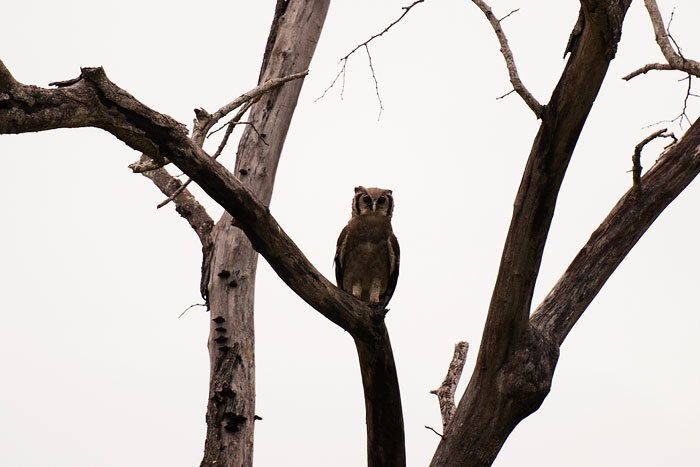 A Giant Eagle owl perches in an Acacia tree skeleton – giving us a lovely view of a bird that usually hides away in thicker trees. We found the Dark-maned Majingalane on his own one afternoon, irritatedly shaking away flies from the puncture wound we assume he sustained during his fight last week with the younger male from the south. 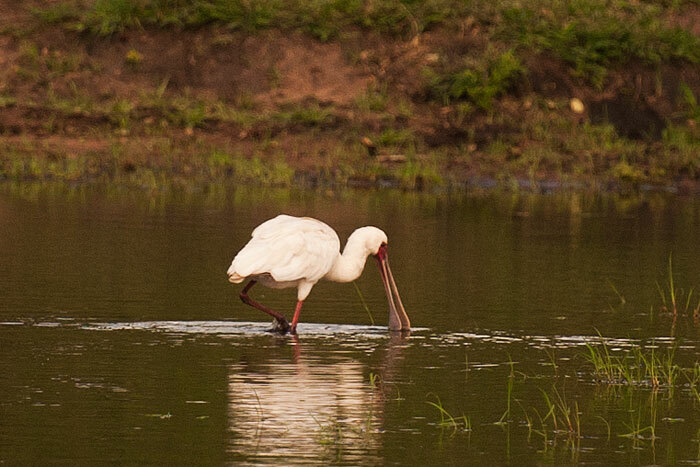 This week I saw a bird I’ve never seen before (called a ‘lifer’ in birding circles) – an African spoonbill, feeding from Makotini Pan. 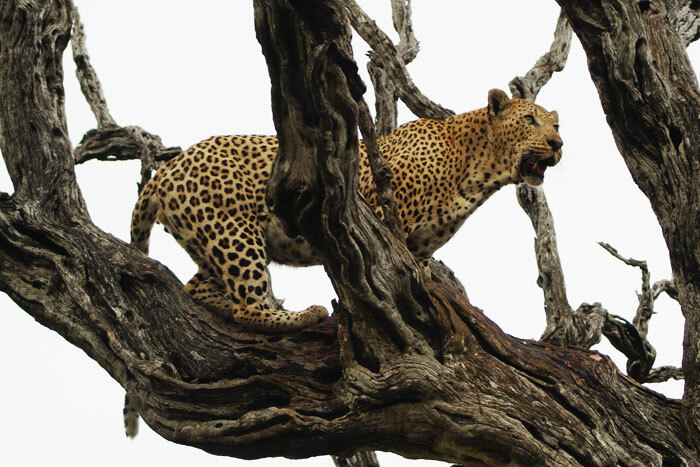 Usually leopards hoist their kills into living trees with thick vegetative cover, so when the Camp Pan Male and his son, the Maxabene 3:2 Young Male, were found having a dispute over an impala carcass in this Leadwood tree skeleton, all of the photographers around Londolozi were very excited! 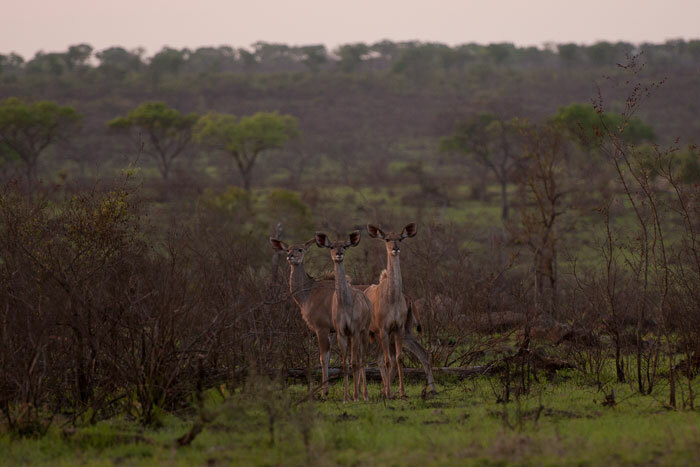 Three kudu cows look at the Tsalala Pride before giving their deep, bark-like alarm call and running off. Another sighting of the Tsalala cub this week! This youngster is extremely curious and always comes to investigate the vehicles when we approach. 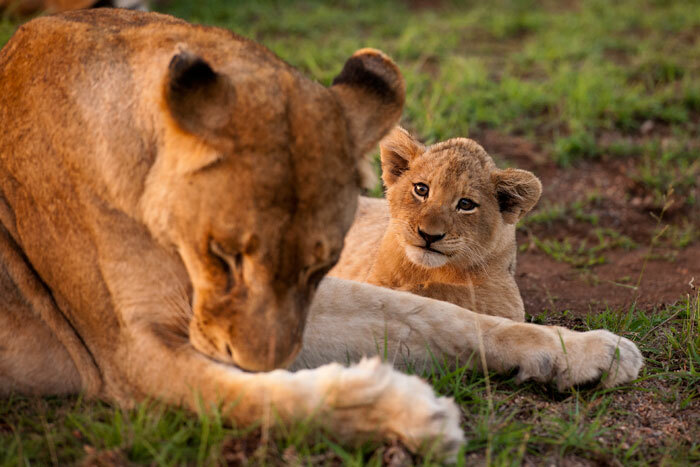 Because her mother is lacking a tail, the little cub seems to be fascinated whenever her sister (the only Tsalala adult WITH a tail) is around. It makes for an excellent playtoy! 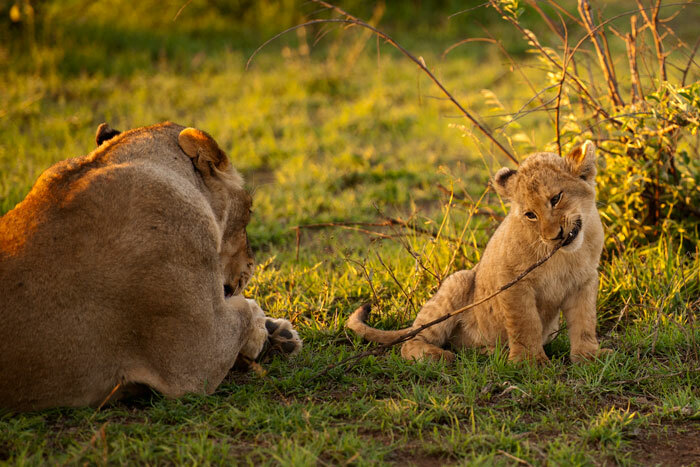 Unfortunately, however, her sister doesn’t always appreciate her antics, so she took the hint and opted to chew on a stick instead. 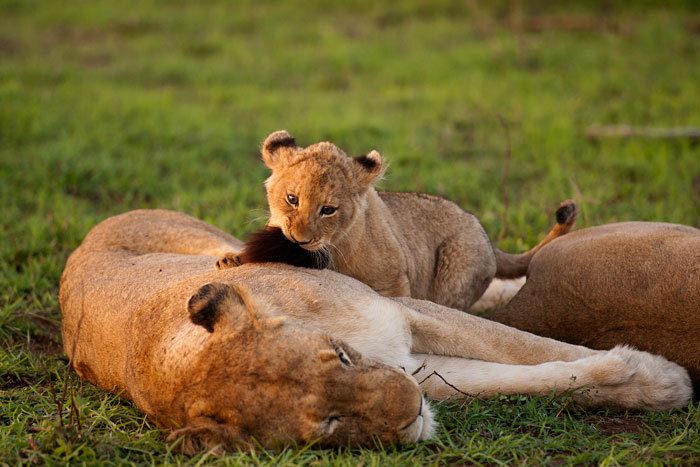 Being the only cub in a pride means she can be spoiled by her mother, but it does have disadvantages as well. There is no one her age to play with! Here, she sits and stares at her other sister (the younger Tailless female), as though begging to play. 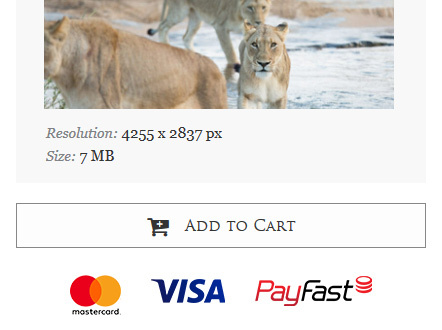 The lioness clearly had no interest. 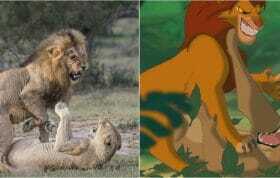 As the three Tsalala lioness began to wake up and get moving, they roared loudly. This seemed to frighten the little one, who ran to her mother for assurance. 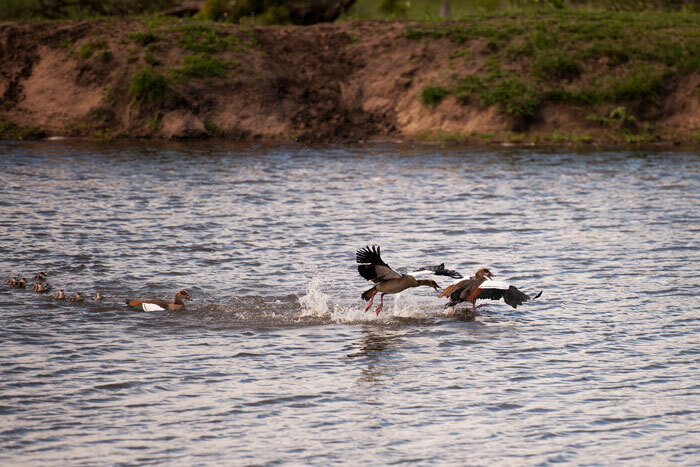 Another very interesting sighting for the week was watching an interaction between some Egyptian geese. An unfamiliar male came towards a pair with their goslings, but was chased away quickly, and we were about to see why. 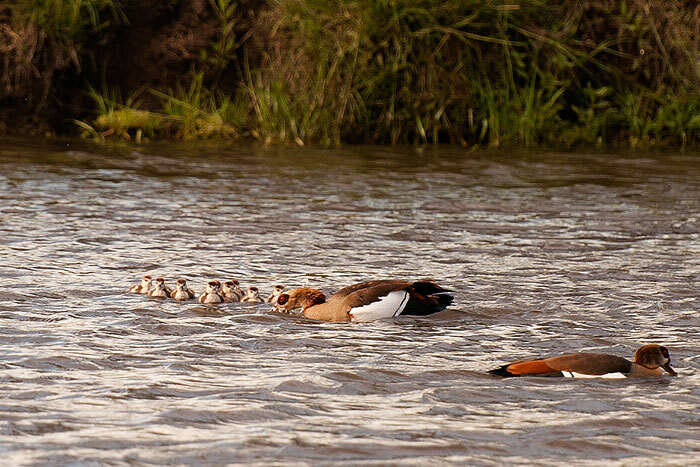 He swooped back in and started drowning some of the chicks! I hadn’t witnesses infanticide in geese before, but it seems the intruder male was trying to kill the chicks to gain breeding rights with the female. 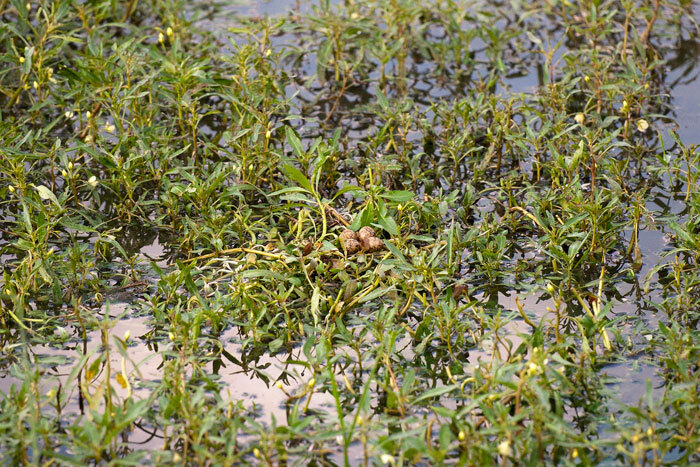 We aren’t sure if he managed to kill the one he was drowning in this photo, but afterwards he did mate with the female. One of my highlights for the week was one of our shortest sightings! 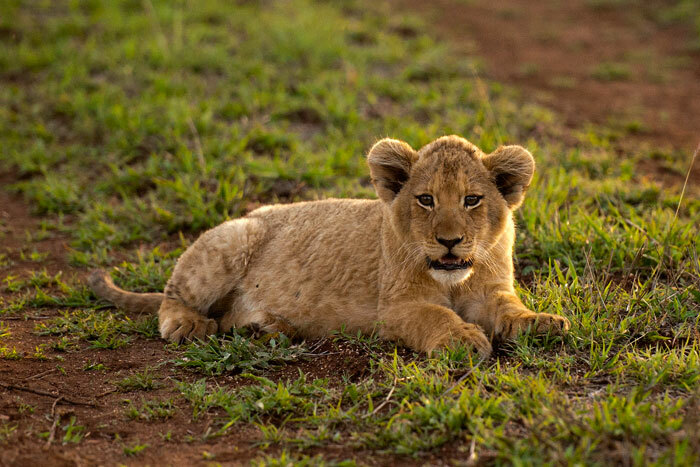 We came across one of the Ximpalapala youngsters while driving around Marthly, in the north of Londolozi. 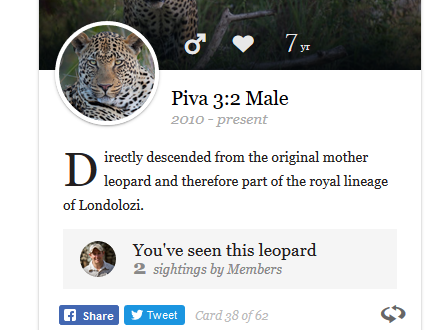 I had heard about these three 9-month old leopards from other rangers, but hadn’t seen them myself yet. 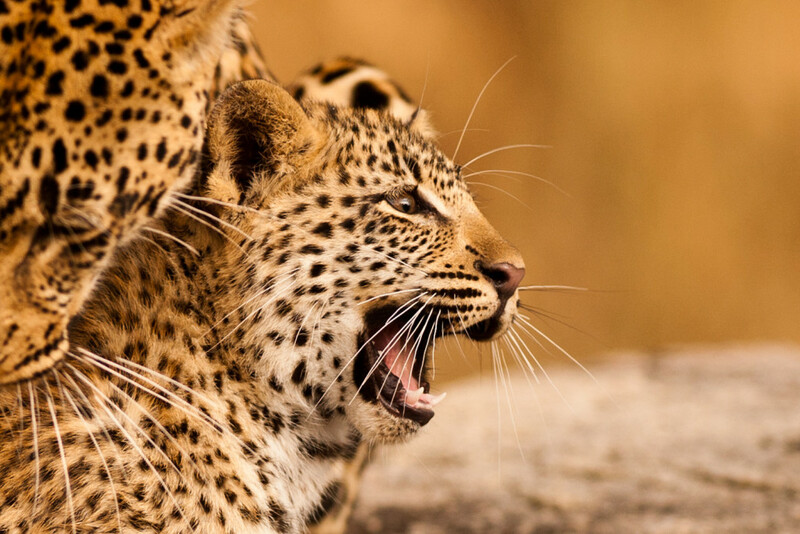 Their mother, the Ximpalapala Female, is unrelaxed with vehicles and therefore rarely seen. However, her 3 cubs seem to be much more relaxed and this one gave us a great view as she perched on a fallen tree just before sunset. Thank you very much for the wonderful pictures. I enjoyed it. 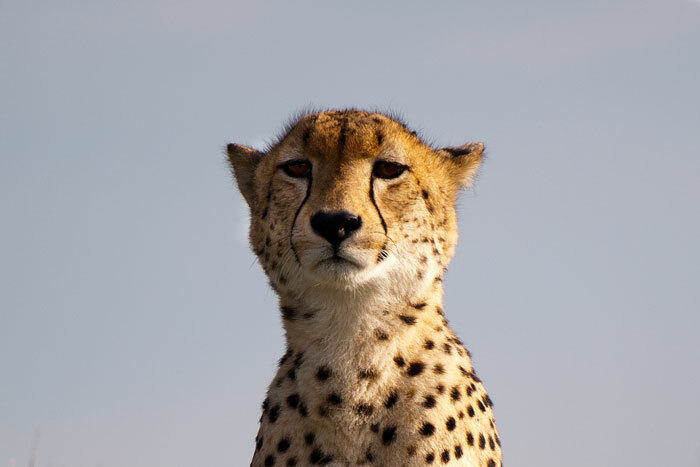 The cheetah loves to pose for you Talley. 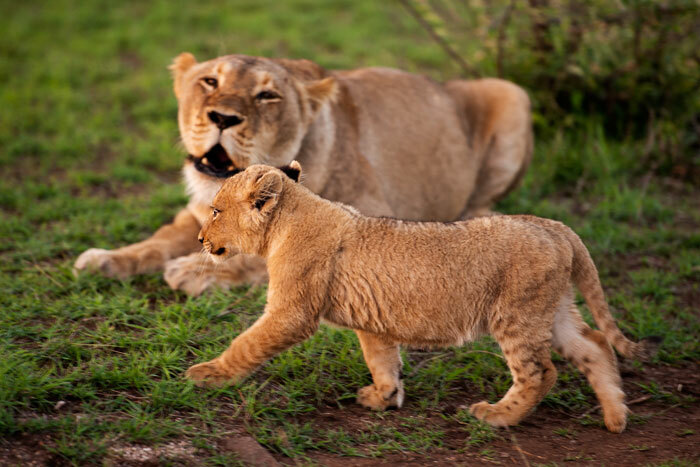 Where are the two remaining cubs of the Tsalala lionesses – younger Tailless and her sister that are pictured? I haven’t heard any news of them lately. Did something happen to them? Talley, can’t blame you for preferring the cats. 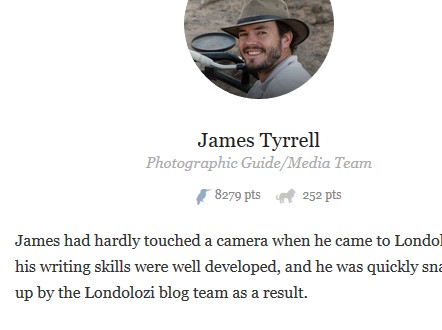 Your pics and stories do them justice. Gorgeous and thank you. 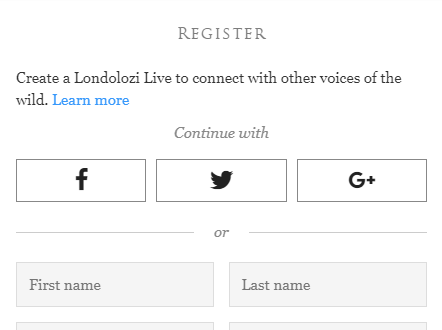 Keeps Londolozi top of mind! You have outdone yourself this week Talley! Great blog and the pictures are perfection as always! What a variety you had this week. 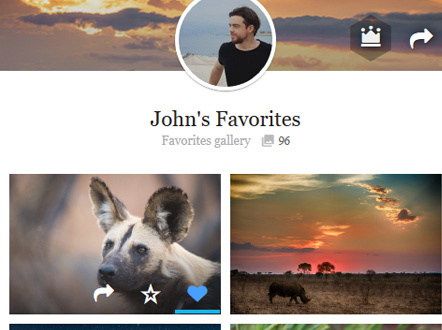 Especially love the picture of the three kudu cows. Thank you so much for giving us a window into your world. 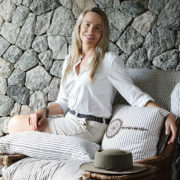 Talley, Fabulous photos, it is always a joy to see what great shots you have taken during the week. 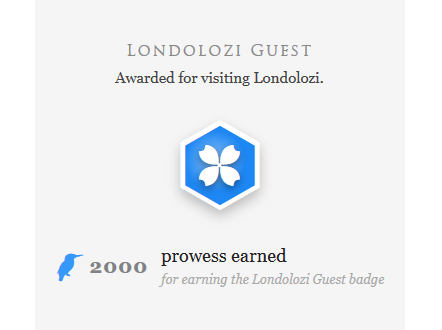 Can’t wait to get back to Londolozi! th a n k s f or good p i c….bu t s o m e o ne sa i d bark ma n e m a j i n g n o t invol v e d i n th e f i g h t e …. Fascinating sighting with the geese! 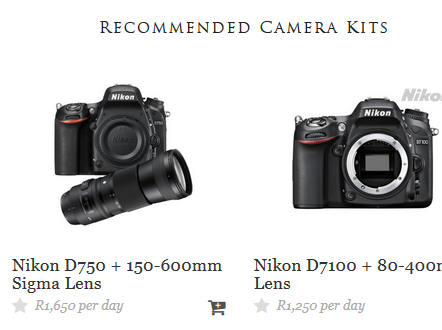 Hi Tal – a great selection of pictures as usual. 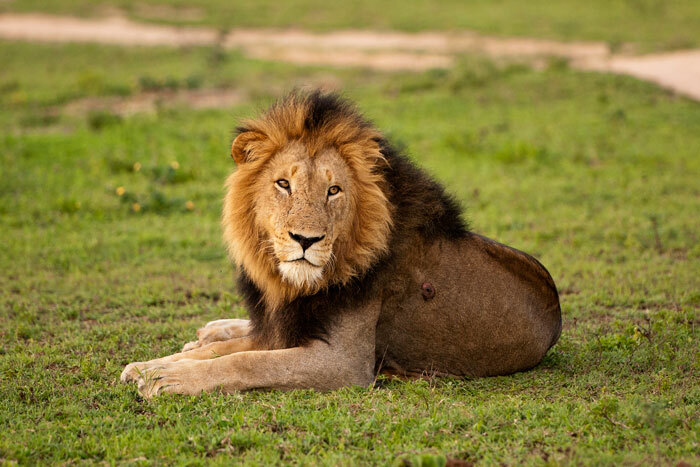 One thing up for discussion – the puncture wound on the Dark-maned Majingilane. He was actually the one male who was NOT involved in the fight with the younger male last week. 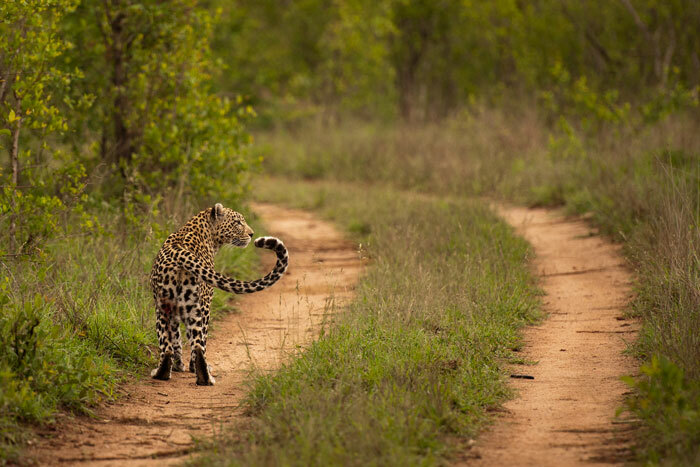 He was found that morning not far from camp, although to be fair, his tracks had come from the South, so maybe he had been involved sometime during the night. It’s up for debate though. I didn’t see him on the morning of the fight, but it will be interesting to look back and see if anyone had any photos of him from that day. how soon afterwards was this photo taken? I would guess that if he was involved in that territorial dispute, he wouldn’t have abandoned his brothers. My guess is that it was a separate incident that he got wounded in. Possibly with the same intruding males, but not during that same encounter. 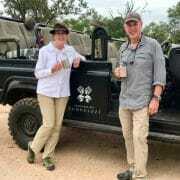 Very interesting pics, specially of the bushbuck having that nasty ear tear and it healed without getting infected hopefully the wounds on the young male lion whom the three majingilane’s attacked would be infection free as well. The animals in the wild are immune to most infections i think. It’s amazing how these animals tolerate the vehicles and remain calm in their presence. In tiger reserves in India, the tigers actually attacks the vehicles and so it is more safe to be on an elephant-back. Tall..I LOVE that shot of the kudu with the broken ear! Excellent pics, as usual! We saw lizards and road toads on our bush walk this morning! Thank you for sharing your stunning photos.. I also have a very soft spot for the felines. it is always a pleasure to get a glimpse into your beautiful world.